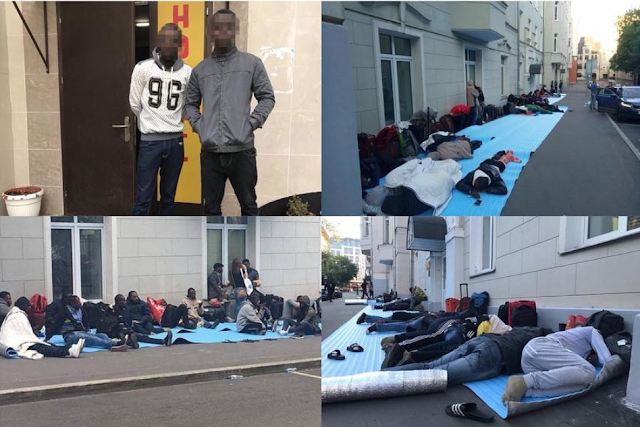 A combination of strict asylum policy for migrants and excruciating hardship have forced a number of Nigerians trafficked to Russia as Super Eagles fans to storm the Nigerian Embassy in Moscow seeking help to return home. They were allegedly made to part with N350,000 each to enable them to travel to the transcontinental country by some agents using the visa-free FAN ID for the 2018 World Cup. It was learned that while some of them were told that there are job opportunities for Africans in Russia, others were told that they could cross the borders into Poland and Finland on arrival in the country to seek asylum. Sources said they were also told that they could seek asylum in Russia if they failed to cross the borders into Western Europe. It was learnt some of the ‘fans’ (including others from Africa) succeeded in crossing into Poland at the early stages of the World Cup. But when the Polish authorities discovered, they tightened security around their borders to stop more ‘fans’ using their country to hit Germany and Denmark. The Russian media reported that some Africans had been detained trying to cross the Finnish border during the tournament. After many Nigerian ‘fans’ failed to cross the borders, they decided to seek political asylum in Russia, citing fears of political persecution in their country. However, they discovered that it is difficult for asylum seekers to obtain refugee status in Russia, with only 582 people admitted as refugees in 2017. With biting hardship after they ran out of money, the ‘fans’ decided to seek help from the Nigerian Embassy. No fewer than 70 of them stormed the Nigerian Embassy calling for Nigerian Ambassador Steve Ugbah to help them. Ugbah promised to provide them with food and shelter while he looks for a way to get them home. According to AP. Crime Russia quoted Telegram channel Mash as reporting that 23 Nigerian citizens stayed at Vnukovo Airport for almost two weeks begging, pestering other passengers, washing in sinks and sleeping in armchairs.